Bone marrow mesenchymal stem cells (MSCs) have been recognized as potential candidates for use in stem cell therapy to ameliorate cardiac function in cardiac diseases such as myocardial infarction through multiple mechanisms [1,2]. However, MSC-based therapy has the vital limitation of poor viability of MSCs after cell transplantation. For instance, only 1% or less of MSCs injected into the left ventricle of CB17 SCID/beige adult mice survived within 4 days of injection , implying that ischemic microenvironment of the infracted myocardium could not be conducive of MSCs survival. Our previous studies have demonstrated that MSCs undergo apoptosis induced by hypoxia and serum deprivation (hypoxia/SD) in vitro, conditions designed to mimic ischemic myocardium [4,5]. Thus, identifying the factors relative to MSC apoptosis and promoting the survival of transplanted MSCs may be vital for successful utilization in cell therapy. As a species of single-stranded small non-coding RNA, microRNAs (miRNAs) work by annealing to complementary sites in the 3'UTR of target mRNA, thereby preventing translation of the transcript or accelerating its breakdown [6-8]. According to miR-Base, release 16.0 (Sanger), more than 1000 unique miRNAs are encoded in the human genome, and they are predicted to regulate expression of a large part of the human protein-encoding transcriptome. Almost all cell biological processes, including cellular proliferation, differentiation, apoptosis and tumorigenesis, are regulated accurately by miRNAs [9-11]. Nevertheless, the knowledge of the miRNAs involved in MSC apoptosis induced by hypoxia/SD is limited. Therefore, exploring the role of miRNAs regulated by hypoxia/SD in MSCs may be helpful to find novel targets to augment the survival of cells after transplantation. 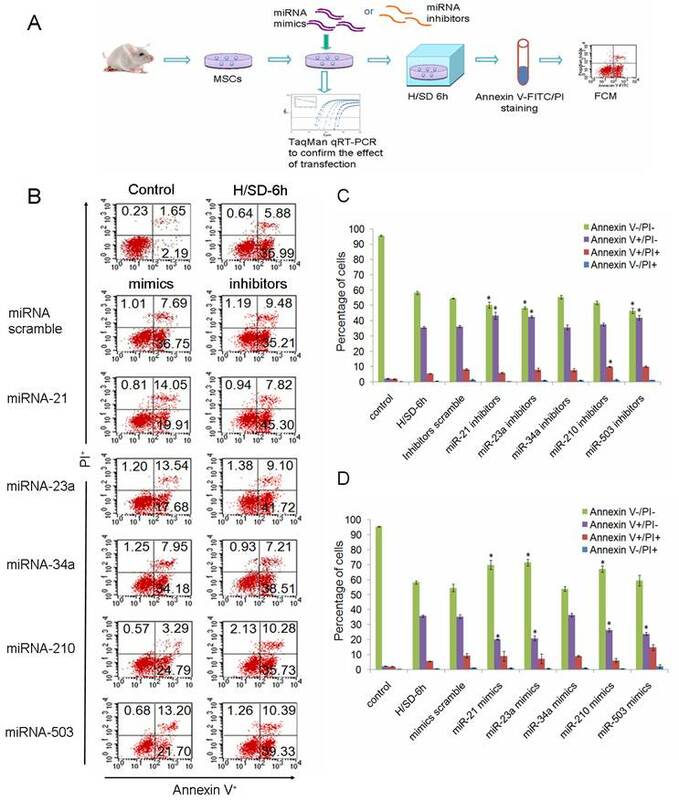 In this study, we have found that, compared with MSCs in normal culture, 60 miRNAs were significantly differentially expressed in hypoxia/SD-treated MSCs; of these, 57 miRNAs were upregulated, and 3 were down-regulated. Over-expression and knockdown approaches were used to investigate the effects of selected miRNAs during MSC exposure to hypoxia/SD. MSCs were isolated from Sprague-Dawley rats (Vital River Laboratory Animal Inc., Beijing, China), and apoptosis was induced by hypoxia/SD as previously described [4,5]. All cells used in the assay were at passages 2 to 3. All procedures in the present study were approved by the Animal Care Committee of Cardiovascular Institute and Fuwai Hospital. MicroRNAs were over-expressed or selectively knocked down by transfection of miRNA mimics (duplexes, GenePharma, Shanghai, China) or inhibitors (OMe modified, GenePharma) using siPORTTM NeoTM Transfection Agent (NeoFx; Ambion, Austin, Texas) according to the manufacturer's instructions and previous description . Total RNA was extracted from cell suspensions of approximately 105 MSCs using Trizol (Invitrogen, Carlsbad, CA). To study the global change of miRNA expression levels, the TaqMan® Low-Density Array (TLDA) Rodent MicroRNA Array Set v2.0 (Applied Biosystems, Foster City, CA) was used to detect and quantify mature miRNAs. Methods were as the manufacturer's instructions and previously described [13-15]. RQ value (relative level of miRNA expression) was calculated by the comparative 2−ΔΔCt Ct method with U6 snRNA as endogenous controls with RQ Manager 1.2 (Applied Biosystems). To verify the accuracy of our TLDA data, we performed single qPCR experiments for representative miRNAs with single-well TaqMan miRNA assays (Applied Biosystems) in accordance with the manufacturer's protocols and as previously described . Comparative qPCR was performed in 6 replicates. The 2−ΔΔCt method was used to calculate relative changes in miRNA expression. The results were normalized to levels of U6 snRNA. Apoptosis was detected by bivariate flow cytometry (FCM) using a FACScan-LSR equipped with CellQuest (BD, San Jose, CA) software after cells had been dyed with an Annexin V-FITC Apoptosis Detection Kit (Invitrogen) according to the manufacturer's protocols. Chromosomal condensation was estimated using the chromatin dye Hoechst 33342 (Sigma, St. Louis, MO) as previously described . The mitochondrial membrane potential of MSCs was monitored using a JC-1 Mitochondrial Membrane Potential Detection Kit (Beyotime Inst), as recommended by the manufacturer and as previously described [17,18]. Cells (2×105) were incubated with 2 μg/ml of JC-1 for 20 min at 37°C before flow analyses. Red and green fluorescence emissions were analyzed after JC-1 staining. Our previous studies have verified that hypoxia/SD induces MSC early apoptosis, with a maximal induction at 6 h . To explore the function of miRNAs in MSC apoptosis, the preferentially expressed miRNAs in normal culture and in 6 h hypoxia/SD-treated MSCs were measured using the high throughput TLDA platform. We confirmed the effect of hypoxia/SD on the apoptosis in MSCs (Fig. 1A), and RNA was extracted from a parallel experimental culture for TLDA screening. The analysis of TLDAs revealed that 60 miRNAs that were differentially expressed (> 1.9-fold change) in MSCs were exposed to hypoxia/SD for 6 h. Surprisingly, among these 60, 57 were up-regulated while only 3 were down-regulated by hypoxia/SD compare to MSCs in normal culture (Fig. 1B). We further analyzed the data and identified miRNAs regulated by hypoxia (miR-21, miR-23a, miR-26a, miR-30b, miR-125b-5p, miR-210) [19,20], miRNAs involved in apoptosis (miR-21, miR-34a) [21-23] and cell cycle (miR-503) [24,25], and miRNAs changed in a clustered manner (miR-345-3p, miR-532-5p). As a result of this, 10 miRNAs were selected from the result of miRNA TLDA experiments for verification by single-well TaqMan qRT-PCR. As shown in Fig. 1C, miR-21, miR-23a, miR-34a, miR-210 and miR-503 were all increased more than 1.5 times after exposure of MSCs to hypoxia/SD for 6 h. To investigate the dynamic change in expression of these 5 miRNAs during MSC apoptosis, we analyzed the expression of miRNAs following different durations (0 h to 12 h) of hypoxia/SD treatment by TaqMan qRT-PCR. With increasing duration of hypoxia/SD in MSCs, apoptosis was increased, and the expression of miRNAs was also increasingly altered (Fig. 2). Interestingly, the relative expression of miR-23a and miR-503 rose very quickly, and the other 3 miRNAs (miR-21, miR-34a and miR-210) reached a 1.5-fold increase after 3 h treatment with hypoxia/SD (Fig. 2B). It has been demonstrated that miR-210 is up-regulated after ischemia preconditioning and is involved in augmenting the survival of rat MSCs . Combining these findings with our results indicates that ischemia preconditioning may promote MSC survival via regulation of various miRNAs. Multiple miRNAs were regulated during rat mesenchymal stem cell (MSC) apoptosis induced by hypoxia/SD. MSCs were incubated for 6 h under hypoxia/SD. All experiments were performed in three parallel sets of cultures which were used for different analyses. (A) Apoptosis was identified by detection of cells with apoptotic nuclear morphology using fluorescence microscopy following Hoechst 33342 staining and by fluorescence-activated cell sorting (FACS) analysis after staining with Annexin V and propidium iodide (PI). (B) Global change of miRNA expression in MSCs was analyzed by using rodent miRNA TLDA screening. (C) Selected miRNAs were verified using single-well TaqMan qRT-PCR. The 2−ΔΔCt method was used to calculate relative changes in miRNA expression. The results were normalized to levels of U6 snRNA. Each data point represents mean ±SEM of six independent experiments. MicroRNAs were altered dynamically with different duration in hypoxia/SD. The expression of miR-21, miR-23a, miR-34a, miR-210 and miR-503 was dynamically regulated in MSCs under different durations of hypoxia/SD treatment, assessed at 0 h, 0.5 h, 1.5 h, 3 h, 6 h and 12 h. (A) Apoptosis of MSCs at each time-point was determined by Hoechst 33342 staining and by FACS analysis. (B) MicroRNAs were verified by using TaqMan qRT-PCR. Each data point represents mean ±SEM of six independent experiments. To investigate the potential functions of miRNAs in the apoptosis of MSCs, we performed over-expression and knockdown experiments by direct transfection of short double-stranded RNAs (miRNA mimics) or their Ome-modified antisense oligonucleotides (miRNA inhibitors). Effective transfer and blockage of miRNAs were confirmed by TaqMan qRT-PCR (Supplementary Material: Fig. S1). The degree of apoptosis was measured by FCM after cells had been dyed with Annexin V-FITC and propidium iodide (PI). MiRNAs were specifically suppressed/over-expressed using their corresponding inhibitors/mimics separately in MSCs and then cells were incubated under hypoxia/SD for 6 h (Fig. 3A). We found that down-regulation of miR-21, miR-23a, or miR-503 precipitated the apoptosis of MSCs. Knockdown of miR-210 increased the amount of MSCs into the later period of apoptosis, but had no effect on the livability of cells (Fig. 3B, 3C). Over-expression of miR-21, miR-23a or miR-210, in contrast, promoted the survival of MSCs when these cells were exposed to hypoxia/SD. We also observed that introduction of miR-503 into MSCs reduced the level of early apoptosis, while increasing the level of later apoptosis, leading to no significant overall change in the total apoptosis level (Fig. 3B, 3D). The involvement in apoptosis/hypoxia of these miRNAs, miR-21, miR-23a and miR-210, has previously been identified in various molecular pathways in different cell types [12, 19, 20, 22, 23], and miR-503 has been identified as being involved in regulation of the cell cycle [24, 25]. 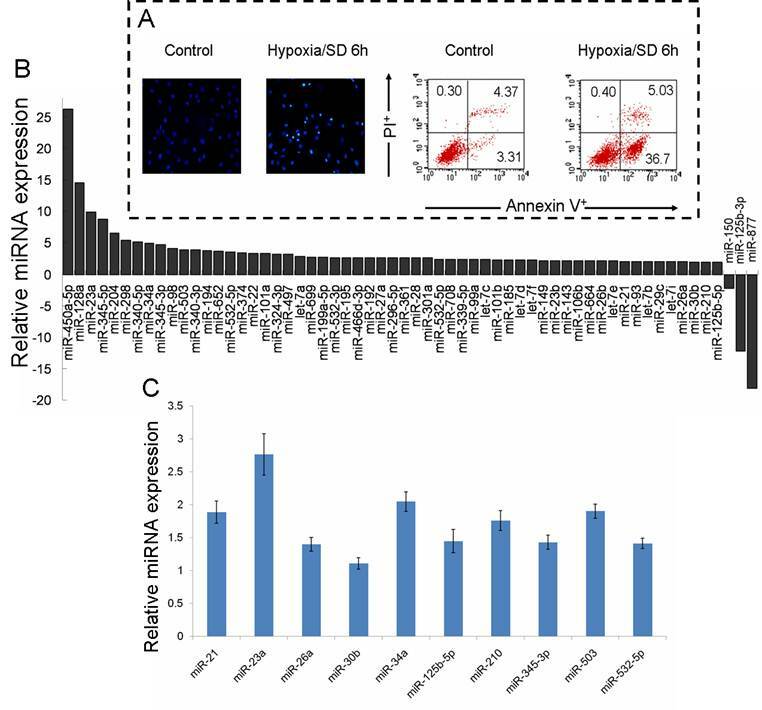 Our findings indicate that these miRNAs may play an important role by regulating their target pathways during MSC apoptosis induced by hypoxia/SD. Loss- and gain-of-function experiments revealed that miR-34a had no obvious effect on MSC apoptosis even though they have been previously reported to be involved in apoptosis in other cell types . miR-21, miR-23a, miR-210 and miR-503 were involved in regulation of hypoxia/SD-induced apoptosis in MSCs. (A) MSCs isolated from rats were exposed to hypoxia/SD for 6 h after transfection with miRNA mimics/inhibitors. Effective transfer and blockage of miRNAs were confirmed by TaqMan qRT-PCR. Apoptosis of MSCs was measured by using FACS analysis after staining with Annexin V and PI. (B) Viable cells are Annexin V─/PI─. The Annexin V+/PI─ cells are at an early stage of the apoptotic process, whereas the Annexin V+/PI+ cells have lost cell membrane integrity and thus have taken up PI. Necrotic cells are indicated by Annexin V─/PI+. (C, D) The results are presented as the percentage of cells. Each data point represents mean ±SEM of six independent experiments. *p<0.05 vs. MSCs transfected with scrambled mimics/inhibitors. miR-21 and miR-23a partly prevented the fall in ΔΨm under hypoxia/SD. MSCs transfected with miRNA mimics were treated with hypoxia/SD for 6 h and mitochondrial potential measured using FACS after JC-1 staining. The ratio of cells with red fluorescence to those with green fluorescence was analyzed. Each data point represents mean ± SEM of three independent experiments. *p<0.05 vs. MSCs transfected with scrambled mimics treated with hypoxia/SD 6 h.
The results of our previous investigation showed that hypoxia/SD-induced MSC apoptosis was associated with a loss of mitochondrial membrane potential (ΔΨm) . In the present study, we assessed whether miR-21, miR-23a and miR-210 enhanced mitochondrial function by maintaining ΔΨm. In contrast to MSCs transfected with the mimics scramble group, cells transfected with the mimics of miR-21 and miR-23a partly prevented the fall in ΔΨm under hypoxia/SD (Fig. 4). This indicated that miR-21 and miR-23a may protect MSCs against hypoxia/SD by preserving mitochondrial function and escaping the mitochondrial apoptotic pathway. MiR-21 has been identified to target programmed cell death 4 (PDCD4), phosphatase and tensin homolog (PTEN) and FasL; all of these pro-apoptotic proteins could trigger the mitochondrial apoptosis pathway [23, 26]. Fas as the potential target of miR-23a (predicted by using TargetScan algorithms) are also associated with the mitochondrial apoptosis pathway . It's worth noting that miR-210 was unable to rescue the ΔΨm under hypoxia/SD treatment (Fig. 4). The reason could be because miR-210 over-expression would create mitochondrial dysfunction by targeting the mitochondrial iron-sulfur scaffold protein ISCU  as well as members of electron transport chain (ETC) complex: NADH dehydrogenase (ubiquinone) 1 alpha subcomplex, 4 (NDUFA4) and succinate dehydrogenase complex, subunit D (SDHD) . In the meantime, miR-210 could induce a shift to glycolysis  and reduce the expression of FLASH/caspase-8 associated protein-2 (FLASH/casp8ap2) , thereby enhancing MSC survival without protecting mitochondria. We have demonstrated that the expression of miRNAs is altered by hypoxia/SD in MSCs and that some of these miRNAs play a critival role during MSC apoptosis. 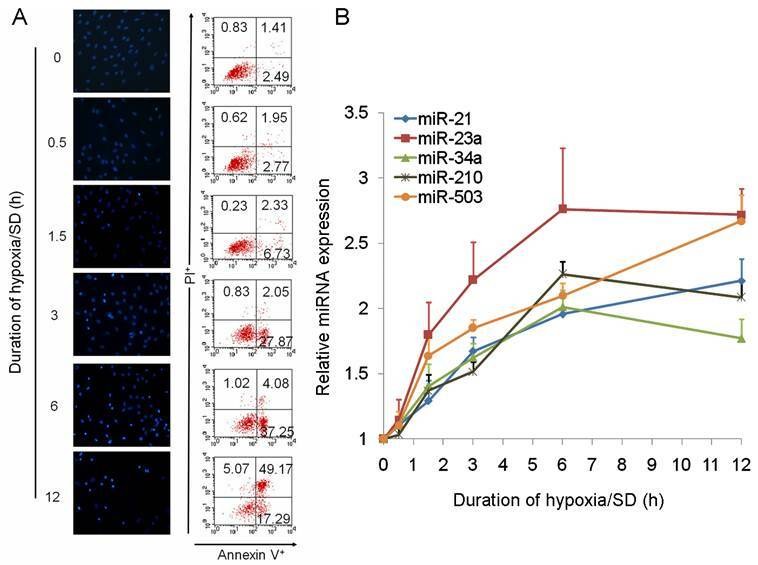 Our results indicate that the up-regulation of miR-21, miR-23a and miR-210 induced by hypoxia/SD may be involved in protecting MSCs against apoptosis. Among them, miR-21 and miR-23a augmented MSC survival partly by preventing the fall in ΔΨm under hypoxia/SD; however, miR-210 may resort to other pathways. 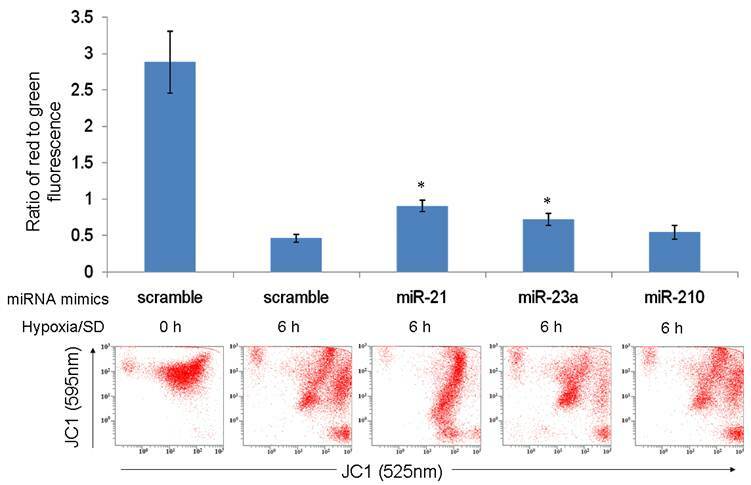 Interestingly, blockage of miR-21, miR-23a or miR-503 exacerbated apoptosis, suggesting that miR-503 might also be one of the hypoxia related miRNAs in MSCs. Exploring the genes and pathways regulated by these miRNAs during apoptosis will lead us to understand the detailed function of these miRNAs in MSCs. The authors are indebted to Dr. Hai-Yong Gu and Jacob Hall Bauer for expert review of the manuscript. This study was supported by the National Natural Science Foundation of China (30770862, 30871024) and the Major National Basic Research Program in the People's Republic of China (Program 973, 2010CB529508, 2007CB512108, 2005CB724600). MSCs: Mesenchymal stem cells; miRNA: microRNA; hypoxia/SD: hypoxia and serum deprivation; TLDA: TaqMan Low-Density Array.